Is your kitchen showing its age? Give your kitchen a face lift with a new look and increased function. Whether you want to do a lot of remodeling or just a few cosmetic improvements, the 10 tips discussed in this article allow you to pick and choose the updates you’re willing to tackle. Read on for ways to revamp your old-fashioned kitchen space into a new, modern kitchen where you’ll love to spend time. Plan before you begin. It’s been said that failing to plan is planning to fail. This saying rings loud and clear when it comes to modernizing your old kitchen. Choose a style that correlates with the rest of your home. For example, if your home’s architecture and decor convey a sleek, contemporary style, a farmhouse kitchen would be completely out of place. You must also set a budget for your desired updates to see how far your money will stretch. Prioritize your wish list of desired updates to ensure your remodeling budget covers those first. Our staff is happy to talk with you and provide an estimate on specific kitchen projects. Rejuvenate your walls. One of the fastest and easiest ways to give new life to an old-looking kitchen is to apply a fresh coat of paint to the walls. After removing all your wall hangings, patch the nail holes to provide a smooth surface for the paint. Choose a paint color to complement the walls colors in the rest of your house. For instance, if the walls in your home are a neutral beige tone, choose a kitchen wall color that complements the existing walls. Select a tint one or two tones lighter than your home’s existing wall color to project a brighter, lighter kitchen space. You can also opt for a shade that’s one or two hues darker than the wall color in your home to provide a cozier feel to a large kitchen. Select two or three paint colors that you like and brush a swatch of each of your kitchen walls. Allow the swatches to dry overnight and look at them at different times of the day to get a more accurate appearance before making your final selection. Reface your cabinets. Old cabinets are a sure giveaway as to the age of your kitchen. If your cabinets are structurally sound, a few cosmetic changes should fast forward them into a more modern era. For a quick update, exchange dated cabinet hardware for new handles, pulls, and knobs. If you want to tackle the cabinet surfaces, you can reface your cabinets to give them an updated look. Request your free consultation with us today to get started. Pay attention to the floors. Have your kitchen floors lost their oomph? Give them a good cleaning to try and restore their original shine and bring them back to life. If that doesn’t do it, maybe it’s time to replace your old kitchen floor with a new update. Carefully examine the flooring that adjoins your kitchen floors before you pick out a new replacement. Observe the color and type of floors that are next to your kitchen floors. For example, if rustic wide-plank wooden floors in the living room border your kitchen, installing a wood floor in the kitchen that differs in color and style from the living room floors will result in a mismatched, awkward appearance. Tile floors in a style and color that complements the wood living room floors would be a practical, more aesthetically pleasing solution. Hang new window treatments. Do your kitchen window treatments look like they were hung a few decades ago? If so, it’s time for a switch. Opt for faux wood blinds with two-inch slats for a modern, functional update to accompany any style or decor. Blinds allow you to adjust the amount and direction of the sunlight streaming into your kitchen during the daytime. You can also close your blinds when it gets dark outside to offer complete privacy. Hang sheer curtains over your blinds for a softer, finished look. Sheers add a layer of privacy during the daytime when your blinds are open. Because outdoor light can filter through the sheer curtains to keep your kitchen light and bright, the sheers also make it difficult for anyone outdoors to see inside. Refresh your counter tops; exchange obsolete counter tops for a refreshingly modern replacement. New laminate counter tops are cost effective if you’re working with a small budget. Laminate is typically available in a wide variety of colors and patterns to suit your decor. Some laminate is even designed to replicate natural stone or wood. If you’ve got a bit more money in your remodeling budget, granite counter tops offer a more durable, natural material with an upscale appearance. A few alternative counter top options include concrete, stainless steel, wood, and marble. Coordinate your counter top colors, patterns, and materials to complement your new kitchen style. Visit one of our three showrooms to learn more. Invest in a new sink. The kitchen sink is a functional focal point in any kitchen. So, if you’re existing kitchen sink has seen its better days, swap it out for a new and improved one. Double sinks with a built-in divider are popular because they provide two separate sinks; one sink typically contains a garbage disposal and is useful for rinsing dirty dishes and utensils prior to placing them in your dishwasher. If you prefer to wash your dishes by hand, the garbage-disposal sink can also be used to trap and eliminate food particles after you’ve finished washing your dishes. The second sink area serves as a space for either rinsing your soapy dishes or providing an area for freshly washed dishes to air dry. A large single farmhouse-style sink provides an over-sized space for placing dishes prior to rinsing for the dishwasher or washing by hand. Decide what sink material works best with the rest of your kitchen, such as stainless steel, porcelain, or some other type. Don’t forget to swap out your dated sink fixtures with modern fixtures. Shiny chrome fixtures coordinate well with a contemporary look; brushed nickel complements a transitional style; and, antique bronze displays a warm traditional aura. Update your major kitchen appliances. Old kitchen appliances not only look bad, but they are also energy zappers and less functional than more modern replacements. Choose matching appliances, including a stove, refrigerator, dishwasher, and microwave, that harmonize with your kitchen style. 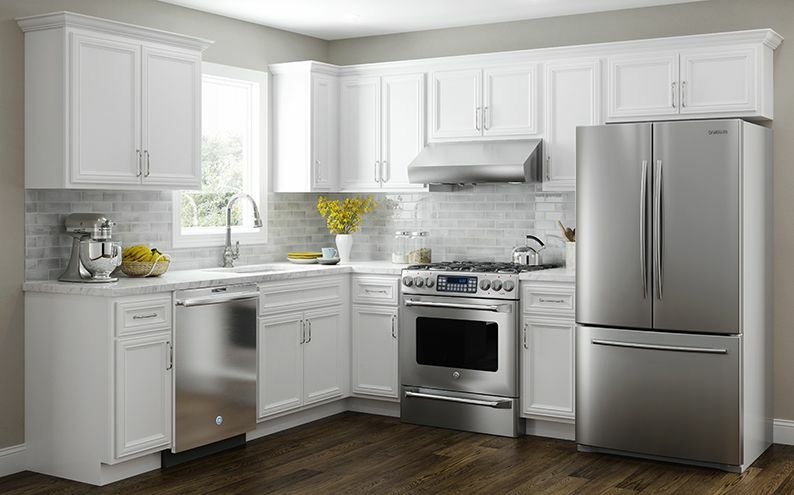 Because these major kitchen appliances come in a wide variety of sizes, functions, and styles, select the ones that fit your personal needs, available space and remodeling budget. New appliances will also save you money over time due to their improved energy-efficient designs. Some companies offer a “package deal” on specific kitchen appliances if they are bought together, which could add up to significant savings over purchasing the items individually. Get rid of old furniture. Outdated, worn-out furniture pieces in a recently modernized kitchen are an eyesore. Wobbly chairs and tables with marred surfaces have no place in a revamped kitchen area. Purchase a new dinette set, island, barstools, free-standing cabinets, plant stands or other kitchen furniture required to finish your refurbished space. Coordinate your new furniture with your kitchen’s new style. For instance, white-painted wood furniture is bright and cheery and resonates a farmhouse style while dark-colored pieces with straight lines infer a more contemporary look. Swap outdated light fixtures. If your kitchen’s light fixtures are reminiscent of a style that was popular years ago, it’s time to exchange them for new replacements. Chandeliers with gold-colored chains and trim need to say goodbye to your new kitchen. Bring in a chandelier with a polished nickel, shiny chrome or oil-rubbed bronze finish to complement your kitchen’s new-and-improved appearance. Replace dated ceiling-light covers with modern-day alternatives. By hanging a few up-to-date pendant lights over your kitchen island, peninsula or bar area, you add functional light with aesthetic appeal. Remember to hire a certified electrician to do any electrical work if you or someone you know isn’t qualified. What’s keeping you from modernizing your old-fashioned kitchen? Now that you’ve read this article take the first step toward a more beautiful, modern kitchen in your home. Pick out your favorite renovating tips and get started on your revamped kitchen today.